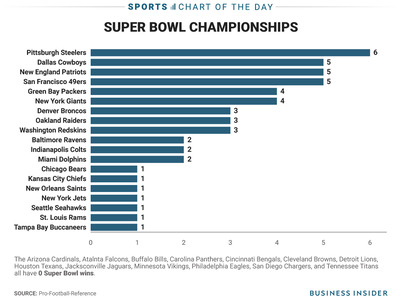 The New England Patriots are a slight favourite to win the Super Bowl, according to Nate Silver and FiveThirtyEight. It would be a record-tying sixth Super Bowl win for the Patriots, breaking their second-place tie with the Dallas Cowboys and the San Francisco 49ers. In all, six franchises have won at least four Super Bowls, accounting for more than half (29 of 51) of all Super Bowl wins. At the other end, the Philadelphia Eagles are one of 13 franchises that have never won a Super Bowl. Those teams have combined to play 564 seasons during the Super Bowl era.